A solar PV system today, is not just a great source of savings, but is also a great financial investment which can give you an ROI as high as 20%. But what if we tell you there is an additional 30% capital subsidy for you? Too good to be true? Not really! 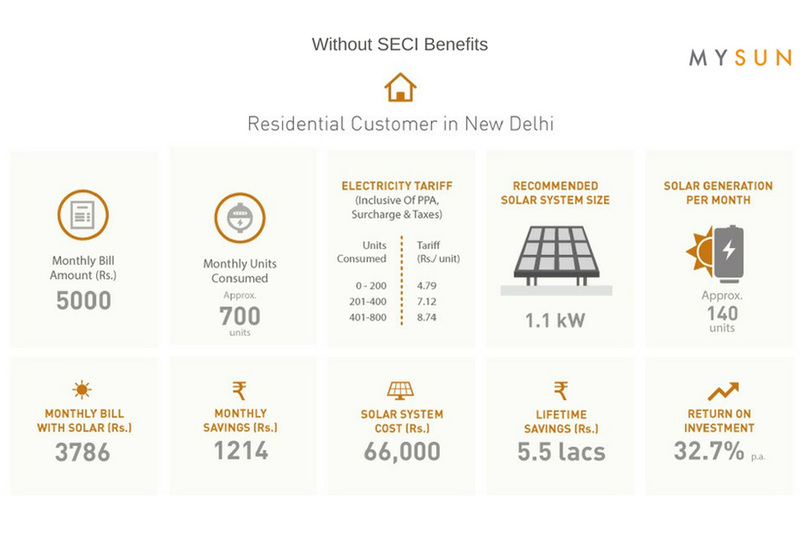 This limited time scheme, launched by GOI and SECI, has earmarked a capacity of 2 MWp for the residents of Delhi. 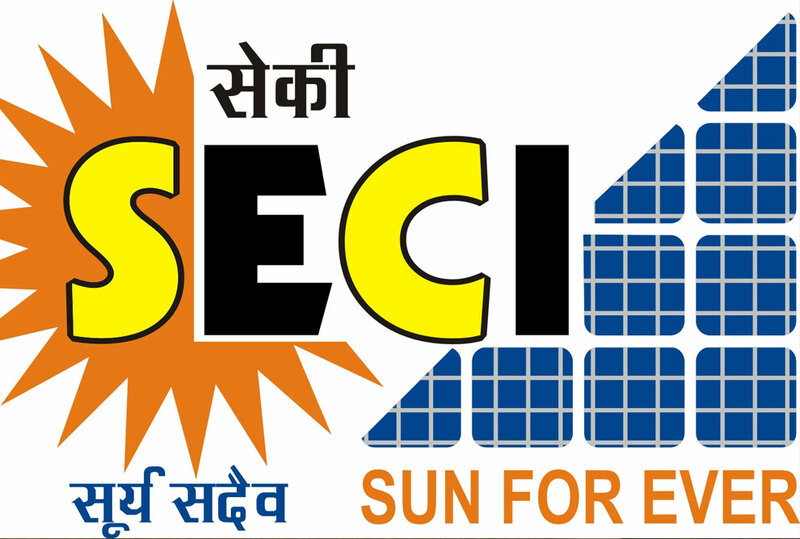 You may be amongst the very few residents who can buy a solar PV system at approx Rs 40,000 per kW against a market price of approx Rs 60,000 per kW. There has never been a better time to go solar, thanks to this opportunity. Don’t let it go. You can buy a Solar PV system up to 25kWp capacity. Check your ideal system size here. Still lost in thoughts?, We have made it really simple for you to earn this subsidy and start your journey to go solar. 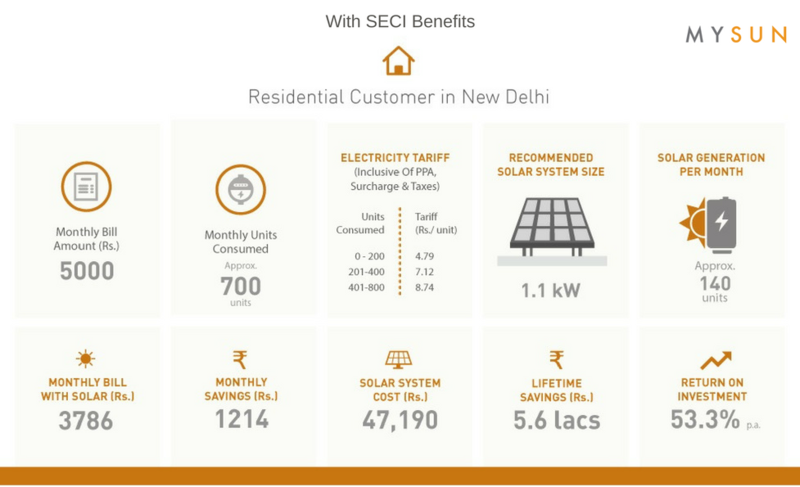 Welcome to a first-of-its-kind consumer-focused online solar marketplace, MYSUN, where not only all your queries about solar are answered, but we connect you with multiple pre-screened solar installers to get the best price and quality solar system for you. In short, MYSUN is your Solar enabler, so sign up now by visiting us here and earn all the benefits and more of going solar. You can reach out to us using the details on our Contact us page here. For those of you living in Delhi, our team will be visiting your neighborhood soon and will be pleased to answer any queries and to help you register your rooftop. To register your interest, please leave a comment below or reach out to us via our Social Media handles or E-Mail.